Beans contain special sugar molecules known as oligosaccharides. These sugar molecules require special anti-oligosaccharide enzymes which is absent in the human digestive track to properly digest them. The incomplete digestion therefore produces gas which causes discomfort and flatulence. This indigestion, bloating and subsequently, flatulence are the major factors limiting the consumption of this nutritious and healthy staple food. But we will not let this problem force us to abandon the wonderful benefits of eating beans. The following practices and habits should help reduce the problems associated with eating beans. Always wash dry beans thoroughly then soak for at least 3 hours before cooking them. Then when you start cooking, boil for 5 minutes, discard the water and rinse again. This helps eliminate some of the molecules that favour gas formation. Do not add salt right away when cooking beans. This cooking advice is important because adding salt too early slows down or hampers the process of boiling off the unwanted substances which cause gas and subsequently indigestion. Never undercook beans. Most dry beans should be cooked for at least 1 hour, except when using pressure cookers. Cooking the beans thoroughly continues the process of eliminating the complex oligosaccharides. Always prepare beans recipes where beans are mixed with other staple foods such as Rice and Beans and Beans and Yam/Plantain/Potato/Baby Corn Porridge. This is so that your digestive track does not have too much beans to digest in one meal. 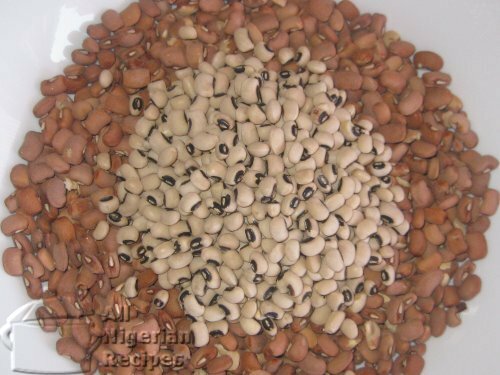 Prepare the beans recipes where the beans coat is completely removed such as in Nigerian Moi Moi, Akara, White Moi Moi (Ekuru) and Peeled Beans Porridge. Removing the beans coat greatly reduces the unwanted substances in the beans. Eat beans and similar legumes regularly to build up your body's ability to process them. Limit the quantity of beans you eat in a meal. Start with small quantities then slowly increase consumption levels as your digestive track adapts to digesting the beans. Drink more water than usual when eating beans. This will help the digestive enzymes process the food better. Carbonated drinks add to the gas production problem so they should be avoided when eating beans. Hopefully these techniques will work for you. If not, no problem, give it more time. Remember that flatulence is only a social concern, there is no psychological or physical harm caused by eating beans. So do not allow a little gas stop you from enjoying the nutritional benefits of eating beans.